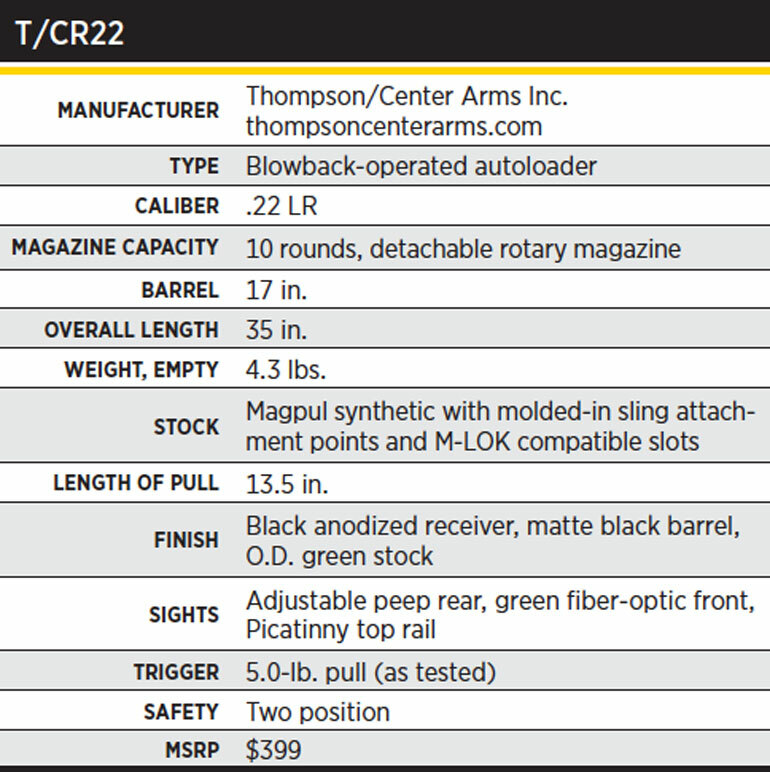 Thompson/Center Arms has a new .22 LR semiautomatic rifle called the T/CR22. It comes with a 17-inch barrel with a threaded muzzle, a Magpul synthetic stock, and a 10-round detachable rotary magazine. Shooting Times obtained one of the first to come off the production line, and I put it through our standard shooting review. It performed very well. Before I get into the shooting results, let’s take a quick look at the features of the new rifle. Some of you may recall the T/C Classic, Classic Benchmark, and R55 rimfire autoloaders. They were produced from 2000 until 2011. Well, the new T/CR22 is strikingly different than those rifles. The T/CR22 comes with a green fiber-optic front sight. The T/CR22 weighs 4 pounds, 5 ounces, which is fairly lightweight for this type of gun. The light weight is the result of the fully machined 6061 aluminum receiver, the slim barrel, and the synthetic stock. 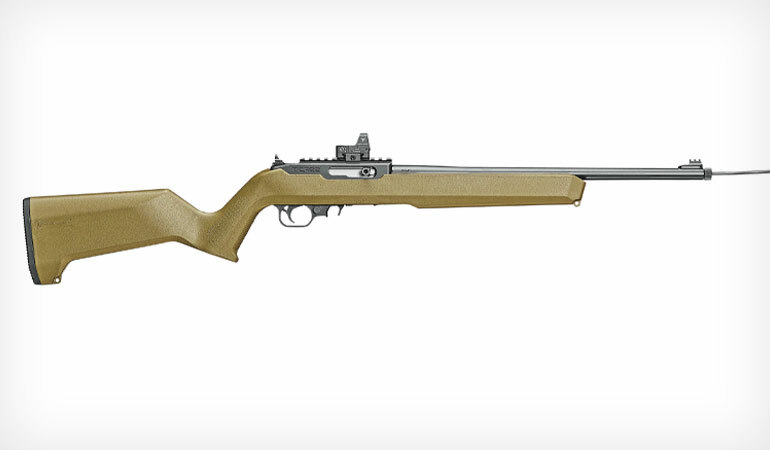 The rifle is patterned after the Ruger 10/22 semiautomatic, and it uses a 10-round rotary magazine that is very similar to the 10/22’s; however, the T/CR22’s magazine has a built-in first-round load-assist lever. 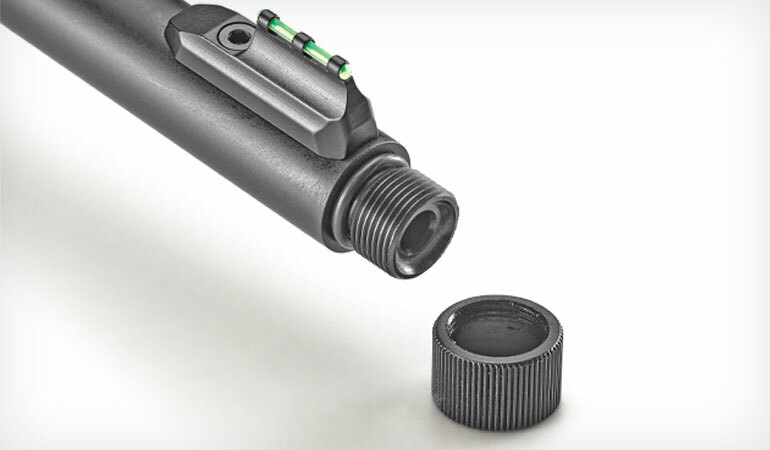 Also, when using the T/C factory magazine, the T/CR22 has a last-round hold-open feature. Note: The carbine is compatible with most aftermarket accessories for the 10/22. My review sample T/CR22’s tapered barrel is threaded at the muzzle (1/2-28), and it measures 0.62 inch in diameter where the threads begin. And as I said earlier it’s 17 inches long, and it comes with a screw-on thread protector. The new T/CR22 uses a 10-round rotary magazine; features an integral Picatinny rail and an adjustable rear sight; comes with a Magpul O.D. green synthetic stock; and has a button-rifled 17-inch barrel complete with threaded muzzle. The receiver features an integral Picatinny top rail, and the carbine comes with an aperture-type peep rear sight that’s dovetailed into a base that clamps to a ramp that’s integral to the receiver. It is adjustable for windage and elevation. The gun has a green fiber-optic front sight that’s secured to the barrel by a hex-head screw. The carbine’s bolt is stainless steel, and it has an oversize bolt handle, which makes charging the action quick and easy. The action has a push-button safety located in front of the trigger guard. The bolt-hold-open lever is located ahead of the trigger guard, between the safety and the magazine release lever. 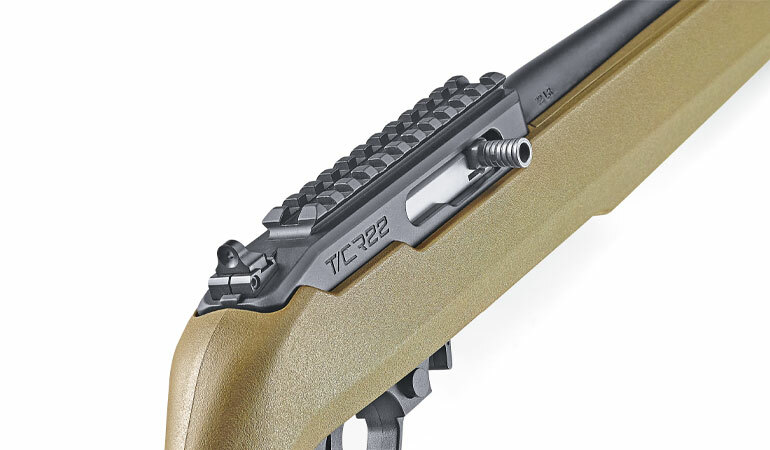 The T/CR22’s Magpul composite stock has slots in the fore-end that accept M-LOK accessories. It also has molded-in sling-attachment points. And its barrel channel is relieved slightly to allow the barrel to float. 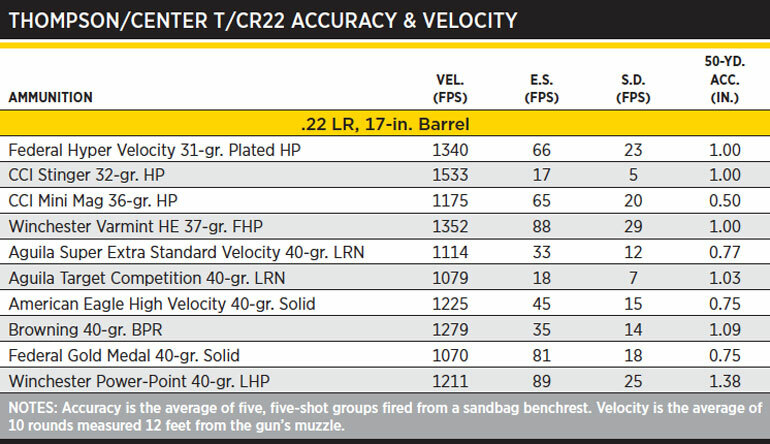 I put 10 .22 Long Rifle loads through the T/CR22, and its accuracy was outstanding. Its best single five-shot group measured a mere 0.25 inch. That’s at 50 yards. Four out of the 10 loads averaged 0.77 inch or less, and overall average for all 10 loads was 0.93 inch. The accompanying chart summarizes my results. At an average of 5.0 pounds (measured with an RCBS trigger pull gauge), the trigger pull was heavier than I prefer, but it was consistent and didn’t take much time to get used to. The consistent trigger pull and the free-floating barrel no doubt contributed to my gun’s excellent accuracy. After putting the T/CR22 through my accuracy shooting session from the bench and switching to the Nikon SPUR red-dot reflex sight, I just had to walk the woods in search of small game, namely fox squirrels. I don’t care what anyone says, I flat-out enjoy hunting small game. After all, any day traipsing through the timber is a good day. And to put a cherry on top, I was successful, easily bringing two plump squirrels to bag. The new T/CR22 is accurate, 100-percent reliable (not a single misfeed or failure to eject in the firing of almost 500 rounds), and easy to tote afield. It’s fun to shoot and more than capable of filling the stew pot.